When thirty-eight-year-old France’s father calls to say that her mother, Grendy, has run off, France suspects foul play and heads south to investigate. 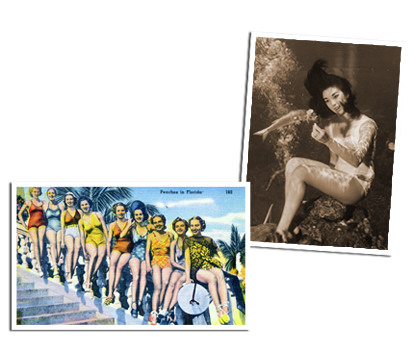 Recently reunited with fellow former “mermaids” from Mermaid Springs, Florida – one of the Sunshine State’s premier, pre-Disney attractions – Grendy had successfully revived her career in kitschy underwater pageants. But if she doesn’t find herself or let herself be found soon, she’ll miss the big Labor Day show. While the other fin-toting “merhags” regale France with stories of old – particularly the night Elvis came to town – they’re suspiciously tight-lipped about Grendy’s disappearance. Increasingly convinced that Grendy is in trouble – and that a psychic cat might hold the clue – she makes a series of unexpected, extraordinary discoveries about Mermaid Springs, her mother, and in turn, herself.